Okay, lets keep up with the analysis of data? That sounded weird, anyhoo if you missed the first part then click here. Also, remember we are still using the skill chart for reference as to some of the conclusions. Okay? OK.
* Pain must be ridiculously powerful, maybe the strongest ninja in the Naruto universe. Pain man- handled Jiraiya even before revealing his “Six Paths of Pain” (Jiraiya was able to sustain himself without being completely dominated only for a while) and then smacked him around with summonings, taijutsu, ninjutsu and some weird genjutsu towards the end. Then there was the part that was not shown in between, where the 6 avatars of Pain attacked Jiraiya.It ended with Jiraiya only being able to trap one of them and loosing the ability to sustain Sage Mode anymore. PAIN’S STATS ARE STILL UNKNOWN!! Given that Jiraiya pushed him so hard so as to make Pain reveal his secret… Pain’s abilities are far beyond an S-class ninja. This just means that Pain must be on some level comparable to that of Rikkudou Sennin (the sage who created ninjutsu) or even superior. I mean we know that Nagato (Pain’s “real name”) was able to control and use all of the 5 elemental chakras by the age of 7, yet we did not see him even use one of them during his fight with Jiraiya… nor do we know if he has the capacity of fusing them to make Mokuton and/or Hyouton like elemental techniques, given he has the eyes of the person who helped the first ninjas understand how to use them. Then there’s facts like him finishing a whole civil war, by himself! Murdering the leader of the Hidden Rain Village (who even the Legendary Sannin had in upmost regards as a very powerful opponent) and all his allies and family, and has a technique in which he has complete awareness of all that happens in the radius of the whole village and to an unknown limit, it’s surroundings. 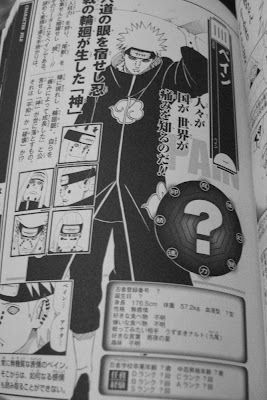 No doubt that by the present chapter (424), 6 Pain’s are very troublesome to handle even for an elite ninja as Kakashi and other Jonin and Chunin of Konoha… I can only wonder what the original body is capable of, I’m guessing it’s not friendly. A true feeling of fear and desperation will come, to any mortal who dares challenge a god.